Winter weather is hard on an automobile, truck or SUV. Extremely cold temperatures, snow and ice can lead to hard starts, rough idling, stalling and even accidents. Those who are lucky enough to have a garage to keep your vehicle in at night will experience fewer problems than those whose cars have to brave the elements while being parked outside. Since cold weather can make existing engine problems worse, it is important to have any potential problems checked out quickly. That way you won’t be stuck somewhere when your car or truck won’t start. Here are our recommendations for cold weather vehicle maintenance on how to keep your vehicle running smoothly when the temperatures drop below freezing. 1.Replace dirty air, fuel and PCV filters. This will ensure adequate air and fuel flow to vital parts of your engine. 2. Test to see if the HVAC control switches and blower work in all positions and at all speeds. Also make sure all head, tail and brake lights are highly visible. 3. Check to see that your air conditioning system is operating properly (yes, even during the winter months). In the defrost mode the AC compressor should engage. This will eliminate moisture build up on the inside of your front windshield. 4. The level and concentration of your engine coolant should be checked. A 50/50 mix of anti-freeze and water is normally recommended. 5. Don’t forget to check the belts, clamps and hoses for wear and tightness. Springing a coolant leak in the winter can leave you standing in the snow on the side of the road. 6. Replace old windshield wiper blades and stock up on windshield wiper solvent. We all know what it is like to try to look out a dirty, streaked windshield when it is snowing, sleeting or raining heavily. It‘s no fun and can lead to accident. 7. Extremely cold weather can take its toll on batteries. Unless you have the battery tested, there is no easy way to determine the condition of your battery. If your battery is over three years old, you may want to have it checked by an auto technician. Scrape away corrosion from the posts and cables and make sure the connections are tight. 8. Worn tires are of little use in winter weather. Examine your tires for adequate tread depth and uneven wear. Rotate your tires as recommended and make sure your spare and jack are in good condition. 9. “Be prepared” is important advice when traveling during the winter months. Carry gloves, boots, blankets, flares, ice scrapper, a small shovel, some sand (or kitty litter), a flashlight and a cell phone. Having these items available in your vehicle in case of an emergency will allow you to help yourself or get help if needed. Most of us still have to drive in cold or inclement winter weather. 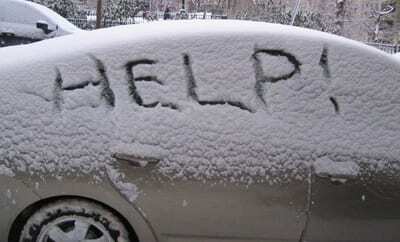 So it is important that your vehicle be dependable and safe as you travel during the winter months. Take the time now to have your vehicle checked out and enjoy a season of worry-free driving.